Is debt settlement right for you? This article is meant to help you decide if debt settlement is the best option. Are there drawbacks to debt settlement? Are there drawbacks to debt settlement? Like almost anything except for breathing the answer is yes. Damage to your credit. Debt settlement can drop your credit score significantly. However, most people who are at the point where debt settlement is needed are already dealing with less than perfect credit. Also after the debt consolidation process it is recommended you go through credit repair to get your credit back on track. The forgiven amount might count as taxable income. There is a chance that the forgiven debt might be considered as taxable income by the IRS. However with the new tax law significantly increasing the standard deduction that won’t affect most people. Before we get into whether debt settlement is the right option for you lets explore the alternatives to debt settlement shall we? A debt consolidation loan is where you take out a loan and pay off your debts with that loan thus turning multiple payments into one single payment. That may sound good but there are some significant draw backs to these types of loans. The interest rates are usually very high. By the time most people are at the point where they need a debt consolidation loan their credit usually isn’t in mint condition. As a result the lenders will charge very high interest rates; many times above 30%! Many loans even have instant interest. That means you have to pay the total annual interest no matter how soon you pay back the loan. In many cases you’d be better off just leaving your debt unconsolidated rather than getting a high interest rate debt consolidation loan. Getting approved for the amount needed is difficult. If you’re $10,000 in debt or over it won’t be easy to get someone to give you an unsecured loan for the amount needed. Many lenders will require some sort of collateral on top of charging you exorbitant interest rates. Most people who get these loans put their vehicles on the line–assuming the car is worth more than $10,000–and then end up losing their car when they can’t keep up with the high payments. The subprime lending market is harsh. Most people who owe more than $10,000 in unsecured debt and are behind or about to fall behind on their payments are considered subprime by lenders. That means lenders in these markets know a large percentage (upwards of 50%) will default on their loans. In order to cover those losses they must charge everyone else high interest rates and use strong arm tactics to ensure repayment. Making you put your car or home as collateral. Most people would put their car as collateral and then lose their cars when they fall behind on their payments which in turn cripples their ability even further to earn a living. Bankruptcy is a better solution than debt consolidation loans but it’s not without its drawbacks. Qualifying for chapter 7 bankruptcy. The bankruptcy laws changed in the early 2000’s making it significantly more difficult for most people to file for bankruptcy than it used to be. The new bankruptcy law created an ‘assumption of abuse’ for bankruptcy filers. In other words the courts default position is to be that you are trying to commit fraud by filing for bankruptcy. Most Americans no longer qualify for chapter 7 bankruptcy. Chapter 13 bankruptcy takes 3-5 years. That means you’ll have those creditors hanging over your head for that period of time. Debt settlement, on the other hand, only takes 12-48 months on average. A family member filed for chapter 13 bankruptcy and needed a car; badly. However since he was under chapter 13 bankruptcy he had to get the purchase approved by a judge. It took him over a month to get thumbs up all the while he was without good transportation. Bankruptcy is expensive. The average bankruptcy attorney can charge anywhere from $1500 to over $5000 depending upon the complexity of your case. Oh and most of them want their money upfront or a significant deposit first. Bankruptcy could cost your you home. Contrary to popular belief you can lose your house if you file for chapter 7. Bankruptcy ruins your credit for 10 years. Having a bankruptcy on your credit report automatically shuts the door to most lenders. For the next 7-10 years you will be considered a subprime borrower which means you’ll pay extortion level interest rates on all borrowed money and that’s if you can get anyone to lend you money at all. Most of these are scams and most of the ‘non-profit’ organizations were shut down for abusing their non-profit status in the early 2000’s. Typically the ‘counselor’ will negotiate with your creditors and try to get your interest rates reduced. However, since interest rates are still at historic lows chances are that won’t happen. In addition they charge you a monthly fee (sometimes as high as $79 a month) and you are required to pay 2% each month. On top of all that your credit will still be ruined since a lot of lenders consider this equivalent to a chapter 13 bankruptcy! Should I settle my debts myself or use a debt settlement company? The thing about these scenarios is its highly unlikely a creditor will agree to a 50% haircut right off the bat. You can settle yourself but it may be difficult. Remember these creditors have a lot more experience than you. They do this everyday you’ll hopefully only have to do this once or twice in your life. A reputable debt settlement company will give you a professional counselor that is on your side to get the best deal for you. In addition debt settlement companies aren’t allowed by law to charge upfront fees. Get a company that charges based on the amount of debt eliminated. This will give them an incentive to get rid of as much debt as possible. No, contrary to popular belief dishonest companies don’t stay around that long. Debt settlement companies are for profit organizations set up to help customers in exchange for a profit. If they–as any business–weren’t providing value they wouldn’t be around very long. Enron anyone? 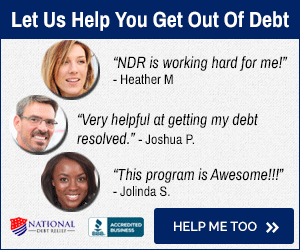 You can find a list of reputable debt settlement companies here. Can I buy a house after settling my debts? Yes, if you have a good payment history and get a credit repair you can buy a house within 1-3 years after the debt settlement process is complete. When is debt settlement the right option? When you should settle your debts truly depends on your particular situation. There is no uniform answer. The best way to know if you should settle is to call 855-224-0820 and speak to a debt specialist. Let’s look at these scenarios to see when settling is and isn’t appropriate. Mary is a single mother of two who earns $30,000 per year as a secretary and is renting in California. She owes $20,000 in debt (not counting her student loans) and is behind on her payments. Her credit is already shot and she is pretty much judgment proof–meaning its not worth her creditors time to sue her. Mary is currently in school to be a nurse and graduates in two years. She wants to to buy a home for her and her two children shortly after she graduates and gets a job. She has consulted a reputable debt settlement company that has said they can settle her debts for 50 cents on the dollar ($25,000). In this scenario I would advise Mary to settle and instead of filing for chapter 7 bankruptcy. 1. If she files for bankruptcy she may not be able to buy a home for the next 7-10 years. 2. She may not get a discharge. Her creditors may argue that while she is indigent now after she graduates from nursing school she will have more means to pay back her debts. A judge may throw out her case. 3. The settlement process takes anywhere from 12-48 months instead of the 3-5 years that a chapter 13 bankruptcy would take. After which she can get a credit repair and still qualify for a home loan after she graduates. 4. It would cost her $2000 to hire an attorney who would most likely want his or her money upfront. She simply doesn’t have $2000 sitting around. Steve is married and together he and his wife Joan make about $75,000 per year, they both live in California, and own two homes a primary residence and a rental. They have mortgages on both of them and very little unprotected equity in the rental but a lot in their primary residence. They owe about $90,000 in unsecured debt and $550,000 on their mortgages . Their renters haven’t been paying, they had a death in the family, and they’ve had many unforeseen expenses. Unfortunately, they’re behind on their payments and have been for two years. Their credit is also shot. They consulted a reputable debt settlement company that has said they can settle their debts for 50 cents on the dollar ($45,000). In this scenario I would advise Steve & Joan to settle. Frankly in this scenario if they were offered a 50% settlement I would advise them to take that offer and run! Katelyn is single and earns $50,000 a year. She is renting but wants to buy a house in Texas in two years. She owes $24,000 in student loans and has $30,000 in credit card debt. Katelyn went on some shopping sprees and used her credit card to make up for expenses not covered by her student loans. She was able to make her payments until a year ago when she had to pay for her mother’s medical expenses and burial. Unfortunately she is behind on her payments and her creditors are threatening to sue her. She consulted a reputable debt settlement company that has said they can settle her debts for 50 cents on the dollar ($15,000). In this scenario I would advise Katelyn to settle. She’s not eligible for chapter 7 bankruptcy since her income is well above the Texas median income for one person. A chapter 13 bankruptcy would take 3-5 years to complete during which time she couldn’t buy a house. Kyle is a single college graduate that’s making $30,000 in an entry level job and owes $10,000 in credit card debt. His dream is to quit is job and travel around the world for the next 5 years. His biggest asset is his car which he’s planning on selling to help pay for his world wide adventure. He consulted a reputable debt settlement company that has said they can settle his debts for 50 cents on the dollar ($5,000). In this scenario I would advise Kyle not to settle. I am to the point of filing for bankruptcy. After reading this I will do more research on debt settlement. One question though. How badly does debt settlement hurt my credit and how long does it take? I guess that’s two questions! Debt from fourteen years ago was the only thing keeping me from buying the home my wife and I had always dreamed of. national debt relief was prompt, courteous, and genuinely cared about the problem my wife and I were having.he fought hard for me, and thanks to him, my wife and I are closing on our house next week! I would recommend him to anyone with credit issues!